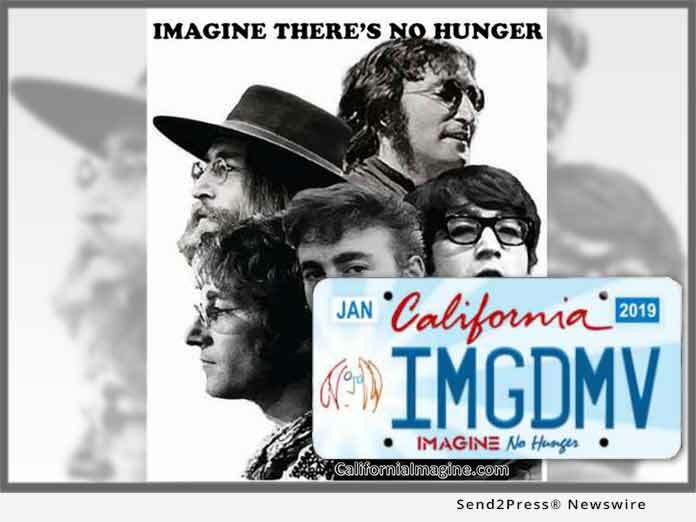 SACRAMENTO, Calif., Oct. 9, 2018 (SEND2PRESS NEWSWIRE) — Today would have marked the 78th birthday of John Lennon, and his legacy is still helping to “Imagine there’s no hunger,” in California, Florida and throughout the United States. Yoko Ono Lennon has kindly authorized the use of the iconic self-portrait image to help the California Association of Food Banks and Feeding Florida in their ongoing fight to end hunger. "These Imagine license plates will bring vital awareness to a critical problem in our state," says Michael Flood, President and CEO of the Los Angeles Regional Food Bank.